The eighth Bishop of Blackburn - the Right Reverend Nicholas Reade - will be enthroned on Saturday. The service takes place at 1030 GMT at Blackburn Cathedral when Bishop Reade blesses the town, diocese and county. The Venerable Reade, formerly Archdeacon of Lewes and Hastings, succeeded Bishop Alan Chesters, who has retired after 14 years. Archdeacon Reade, 56, grew up in Sussex and Guernsey and studied at Leeds University. 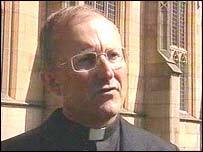 He was ordained in 1973 and became Archdeacon of Lewes and Hastings in 1997. He is married with a daughter.